Product #25876 | SKU Z-ZMCR | 0.0 (no ratings yet) Thanks for your rating! 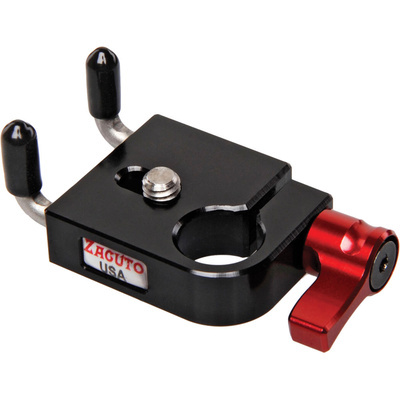 The Zacuto Z-ZMCR Zicro Micro Mount is a single 15mm rod clamp that attaches to any device with a 1/4"-20 threaded mounting hole and provides you a way to mount your device on to a 15mm rod. Once mounted your device can be quickly clamped to the end of an optional 15mm rod or an articulating arm with a 15mm rod end. The Zicro Micro is essentially a small platform that incorporates a 15mm rod clamp and a captive 1/4"-20 tie-down screw that allows you to adjust the position of your device on the Zicro Micro for a snug fit. You can mount devices with a 3/8"-16 threaded hole by using an optional 3/8"-16 to 1/4"-20 adapter. The rod clamp features a spring-loaded locking lever with a small footprint allowing the mount to be used in tight spaces. Two retaining claws screw into the side of the mount, allowing you to position your device against the claws preventing it from spinning on the base. The Zicro Micro allows you to slide accessories with a 1/4"-20 threaded mounting hole onto a 15mm support rod, which allows you to quickly mount/dismount/reposition your accessory onto an optional 15mm rod. The 1/4"-20 tie-down screw is captive in the Zicro Micro platform and features a small amount of horizontal adjustment, which may allow you to snug a device against the two rubber-tipped catch hooks. The rubber-tipped catch hooks are designed to hold your device on the unit and prevent it from twisting on the plate. The catch hooks can be threaded tighter into the plate or un-threaded for more room for your device. If the catch hooks interfere with your device, you can remove the catch hooks from the plate. The spring-loaded locking lever is used to tighten the integrated rod clamp. When working in tight spaces the spring-loaded design allows you to tighten or loosen the clamp without being able to turn the lever fully.